Today’s “Card of the Day” features new Chronoscommand support! [CONT](RC)[Generation Break 1]:If the number of your opponent’s rear-guards is one or less, this unit gets [Power] +2000. 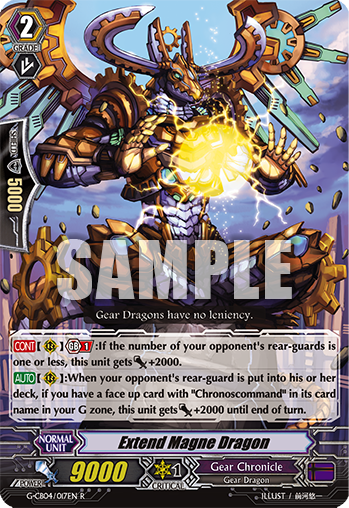 [AUTO](RC):When your opponent’s rear-guard is put into his or her deck, if you have a face up card with “Chronoscommand” in its card name in your G zone, this unit gets [Power] +2000 until end of turn.